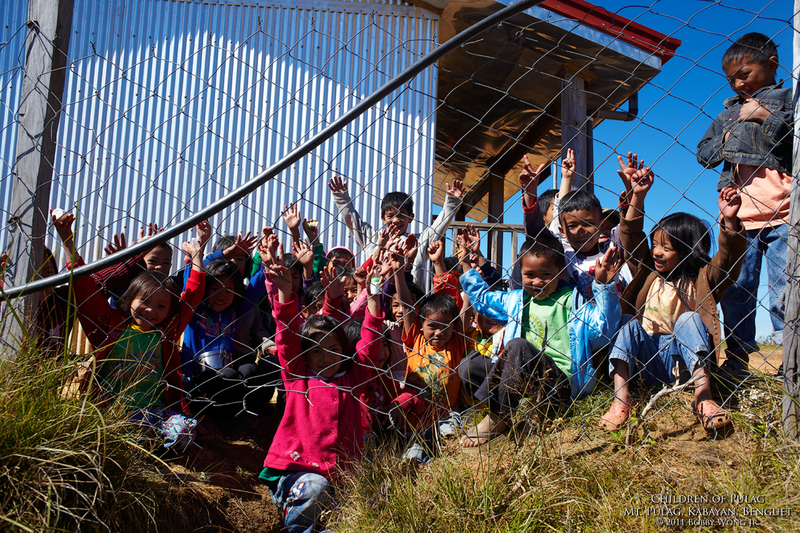 When we travel around our country, one of things we find in absolute abundance are young children. They are friendly, wide-eyed, and generally as curious of us as we are about them. It helps that our country's population is growing at its fastest clip in history. But we shoot them for a very simple reason: they are most willing to be photographed. We were on our way up to Mt. Pulag when we spotted a lone school house by the road. We quickly alighted from our jeepney and walked into a class in progress, introducing our ourselves and chatting up a storm with a most charming teacher. They don't get a lot of visitors like us, and we can't get more compelling photographs of our trips. That's Street Photography 101 when in the boondocks. Enjoy. Where in the world is the Mt. Pulag in Benguet? 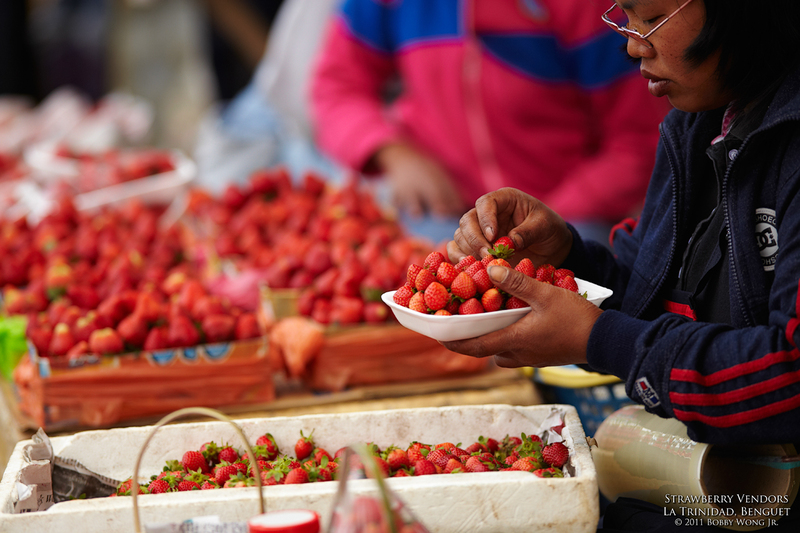 Mention Baguio City and most people will tell you about the ripe red strawberries you can find in the market. But to get the freshest and choicest strawberries, you need to go to the source, to nearby La Trinidad in Benguet. Surrounded by berry fields, you can eat at your heart's desire. Better yet, get on your knees to harvest your own, they are even fresher. But not a berry connoisseur myself I found something more interesting to do: wander along its fringes with a long lens to shoot the village life, much like a sniper. There's a lot going on here, primary of which are farmers gathering and packing strawberries for tourists like me. It's an art form of sorts, to select and arrange the berries for optimal appeal. The process is so consuming that few notice me picking-off their portraits in succession. Sometimes, you just have to go to the source. Enjoy. Where in the world is La Trinidad, Benguet? 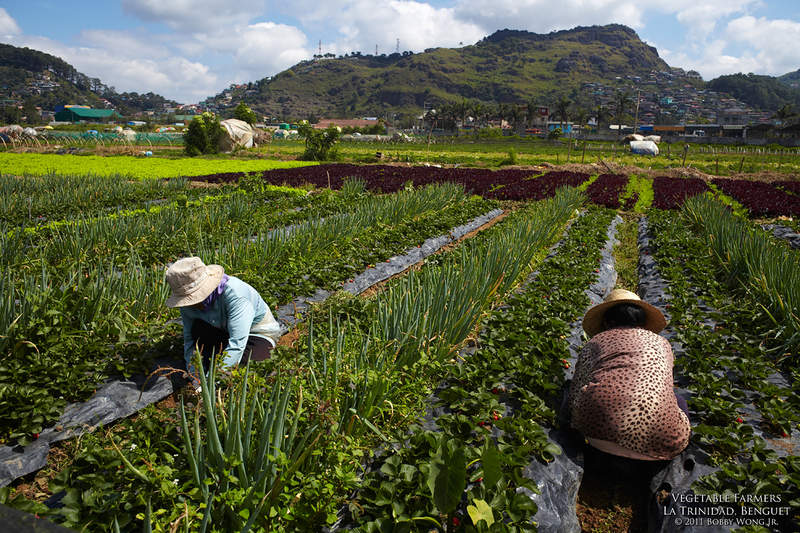 In La Trinidad in Benguet, farmers planted strawberries interspersed among vegetables. I was last here more than 20 years ago but found no special connection to the place, that is, until early this year. You see, Birang and I knew this little girl awaiting adoption. She was queued to go to a childless couple in Benguet, vegetable farmers who had become sterile due to pesticide exposure. Now, finally getting parents of your own is better than having none at all, but we had prayed she would land on more favorable circumstances. But to grow up around pesticides? It was a tense moment. At the last minute, and by a stroke of destiny augmented by prayer, she ended up across the Pacific with this wonderful Filipino couple who loves her dearly. It was a very happy ending, one that almost included this place in Benguet where this postcard was taken. Enjoy. Want to create more jobs? Eat more veggies. Say what? If you live in Manila, chances are the vegetables you eat are grown in La Trinidad in Benguet. What will surprise you is how many people are involved in getting them to you. 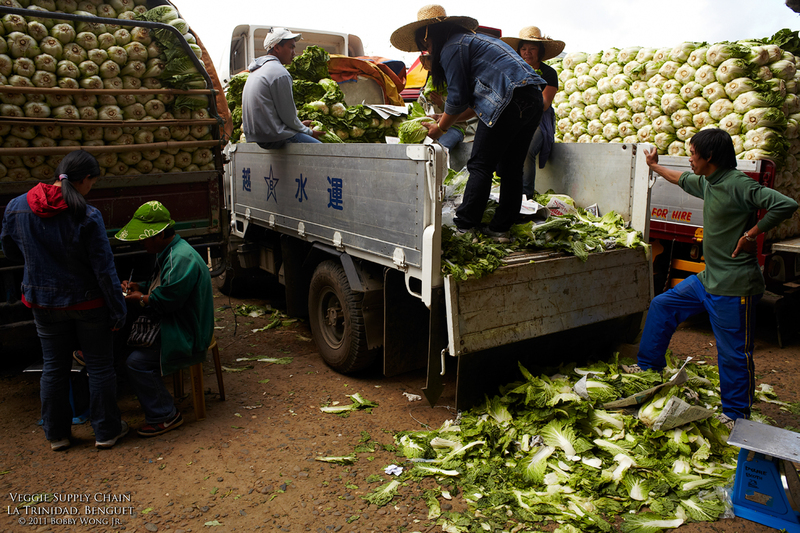 When a sale is consummated, vegetable packers (on the van) pack the correct quantity into plastic bags and hand them over to the buyer's porter. The packers are paid by the number of kilograms packed. The porter is paid by the number of loads he carries to the buyer's truck. That's an entire job ecosystem there. Bet you didn't know you put so many people to work just by eating your veggies! Enjoy. Where in the world is La Trinidad, Benguet?? Another way to make a living at harvest time? When you don't own the field, or can't get any work harvesting it, you've got to find a way to share in the prosperity around you. 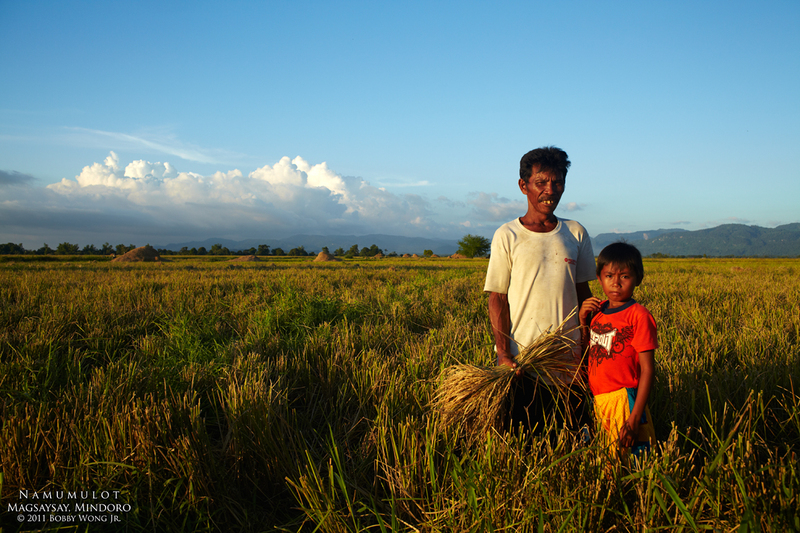 That's when I spotted this farmer and his son, with a handful of rice stalks in hand, busily combing the barren fields at sunset, long after most everyone else had left for the day. 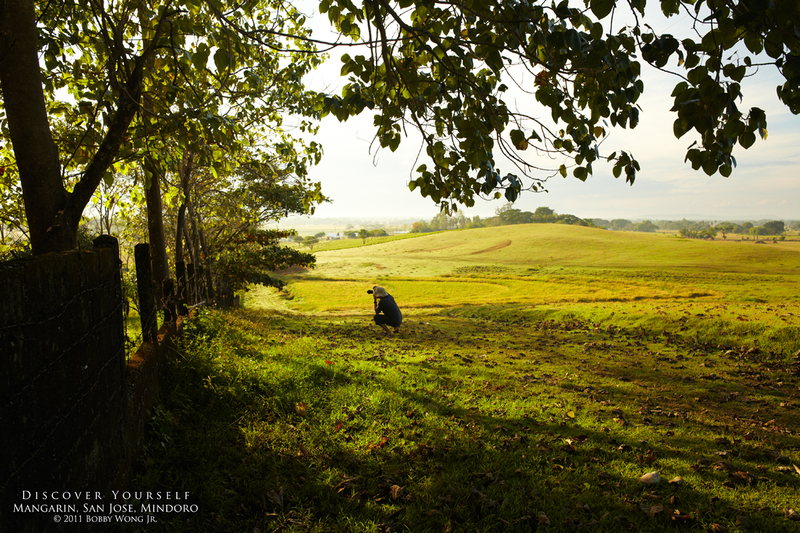 He called himself a "namumulot", meaning someone who picks things up. They are picking up stray and forgotten stalks of rice in the field, given up for dead by harvesters before him. In a large field, given enough diligence, one can still pick off enough to cook a meal or two. One man's trash is clearly another's treasure, if only to illustrate what some rural folks have to do to get by. Enjoy. Where in the world is San Jose, Mindoro? The first day of the year is like no other. It's akin to standing in a comfortable shade while peering out into an open field lit by the first rays of the sun. Whatever was in the past year are still fresh, nestled in the shadows just behind you. And whatever will be in the future is still obscured by mist and haze, just over the horizon in front of you. For the introspective, today will be a day of reminiscence and hope. Do I stay in the comfort of the shadows, in a past that I already know, and watch the new world go by? Or do I step into the light, take my place in the world, and allow my destiny to reveal itself? Enjoy.